Why are more women choosing franchising? People choose to franchise for a variety of reasons. From being unable to reach your full potential in your current career, lack of flexibility in the workplace, or simply wanting to be your own boss using a tried and tested business model. Women deciding to go into self-employment are increasingly more drawn to franchising as they are able to start a business confidently with the ongoing support and training from an established brand. The number of women in the UK in self-employment is increasing at a faster rate than men with now around 1.5 million women self-employed, an overall increase of 300,000 since the economic downturn. Women who choose self-employment are more in control of their own work-life balance and have a far higher job satisfaction than employees working for a large company. With the financial security provided by franchising, women are able to work and earn at a level which reflects their true skills and experience in a career they feel passionately about. 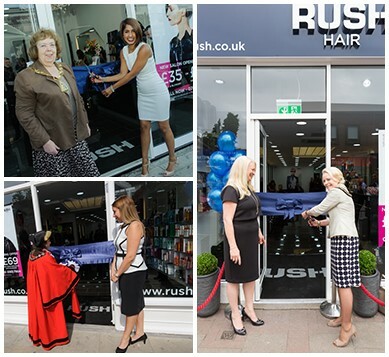 Rush franchisee Nicola Keith-Jopp comes from an experienced hairdressing background and decided to pursue her passion and opened her own Rush salon in 2009. Nicola has worked across all areas at Rush from a stylist to hair consultant, to an educator with Rush’s training academy to a member of the elite workshop team. Her salon continues to be hugely successful and her hard work and dedication has been recognised by the British Hairdressing Business Awards, earning her a nomination for franchisee of the year 2015. Investing in a franchise allows you to start your business confidently where all the tools, training and support needed for a successful salon is provided. By being your own boss you have greater flexibility and creative freedom in a career you are passionate about. Starting your own business is a huge life decision and can be daunting without the right support. When investing in a Rush franchise, you have the backing of an established brand name customers value and recognise, ongoing training and support from a business model that works.